- En achetant ce livre d'occasion, vous pouvez réaliser en moyenne 61% d'économie par rapport au prix d'achat à l'état neuf. - Une personne a créé une alerte prix et souhaite acheter ce livre (28 € maximum). Super Yachts are the epitome of luxury, comfort and boundless freedom. Their design and furnishing stand for premium quality. Choice materials, refined concepts of space and sleek lines pay water, wind and weather their respect. 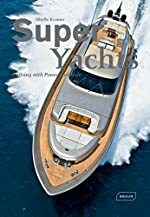 This illustrated volume presents the latest maritime trends in an exclusive selection of 40 motor yachts, all of which were launched in the last few years. High-quality images show the solid craftsmanship of traditional shipyards, as well as the visions of both famous designers and innovative newcomers. The spectrum ranges from modern eco-yachts to multifunctional sports boats and luxury giga-yachts. Super Yachts is an invitation to discover and explore the maritime dreams and visions of the 21 st century. Sibylle Kramer was born in 1967. From 1987 to 1994 she studied architecture at the Hamburg University of Applied Sciences. Before she set up the architecture practice kramer biwer mau architects in 2001, she worked for gmp von Gerkan, Marg and Partners in different functions, such as Chief Representative in Beijing. In 2011 she established her own architecture office, SKA Sibylle Kramer Architekten.